In a relatively short period of time high fructose corn syrup has replaced natural sugar as a sweetener right across the food industry. It is now widely used in products such as cereals, breads, cakes, crackers, soft drinks, soups, yoghurts, baked beans, ice creams, ketchups and salad dressings. In fact, so pervasive is this product that it might be just as easy to list those commercial food products that don’t contain high fructose corn syrup. Should we be worried by the ease with which this highly processed artificial sweetener has suddenly found its way into the food we eat? Well, the problem is that high fructose corn syrup is such a relative newcomer in our diet that, as yet, there is no definitive research into its implications for our health. However, recent studies have suggested links to appetite suppression, obesity, cardiovascular disease, diabetes, and non-alcoholic fatty liver disease. As its name suggests, high fructose corn syrup is derived from corn, but that is where its connection with the natural world ends. The corn is first dried and then dipped in acid. Next it is filtered and spinned. It is then heated with a weak hydrochloric acid, then reacted with enzymes before being distilled and finally diluted. Among the main processors of this ubiquitous ingredient is our old friend Cargill, along with Archer Daniel Midland and Staley (a subsidiary of Tate & Lyle). Bizarrely, the sudden rise of high fructose corn syrup as a key ingredient in much of the food we consume is an unintended consequence of a decision taken by the Reagan administration in the USA in 1982, when it announced the introduction of import quotas on sugar. The move was largely designed to protect the indigenous US sugar industry, but the quotas had the effect of artificially driving up the price of sugar. Within two years both Coca Cola and Pepsi announced that they would replace sugar in their products with the much cheaper high fructose corn syrup, and the rest is (recent) history. You may want to take a closer look at the labels next time you go shopping. In the meantime, here’s a side dish that is wholesome, nutritious and free from unhealthy additives. I’m at that cross-over point on my allotment plot, the Circus Garden where I still have a few crops I planted last year (rhubarb chard and, thanks to the mild winter, salad crops like chicory and land cress) whilst the new season’s early crops are starting to emerge as the ground warms up. Chief cheerleaders for the new season are my herbs, with oregano, chives and mint leading the way, but also coming up is that relatively unsung hero of the vegetable patch, the radish. 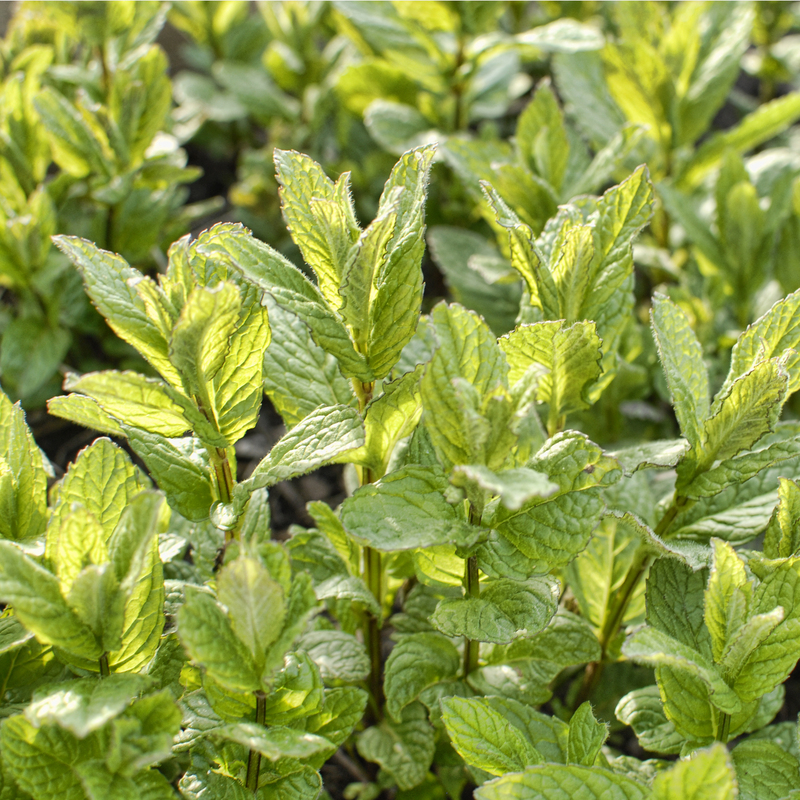 I’m using both mint and radish in this week’s recipe along with fresh, salty, delicious samphire, a vegetable traditionally foraged along the coast and around river estuaries and which is also currently in season. To offset the sharpness of the roasted lemon in this salad I have used a little organic maple syrup, a sweetener which is not only completely natural but also nutritious (amongst many other properties it is a good source of zinc, potassium and magnesium). 1. pre-heat the oven to 230° C.
2. For the dressing, combine the olive oil, lemon juice and maple syrup and whisk together. Add the chopped mint leaves and stir to combine. Set to one side. 3. Use a mandolin or very sharp knife to slice the lemon thinly. Combine the maple syrup and olive oil and dip the slices of lemon in this mixture before laying them out on a baking tray lined with baking parchment, making sure the slices are not touching. 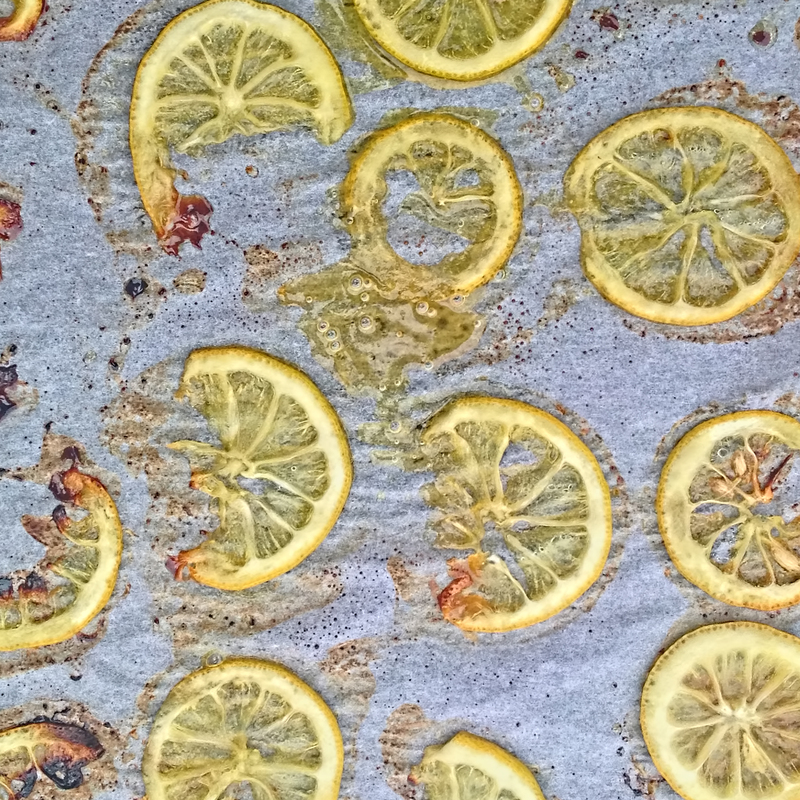 Place in the oven for 20 minutes or until the lemon slices are beginning to brown. 4. While the lemon is roasting, place the hazelnuts on a baking tray and put them in the oven for 5 minutes until they are lightly browned. Keep an eye on them to make sure they do not burn. Remove from the oven and set aside to cool before chopping the nuts roughly. 5. Place the samphire over a steamer for 1 minute then rinse under cold water to arrest the cooking process. Drain and set to one side. 6. Finally, combine the samphire, hazelnuts, radishes and roasted lemon in a bowl and pour over the mint dressing. Toss the salad lightly and then serve. This looks like a delicious combination and a stunning photo. I feel I could pick the ingredients straight off the screen! Thanks for your kind comments, Ann. The elements of this salad do work really well together and provide some good contrasts of colours as well as flavours. So interesting as usual – and a big fan of maple syrup I’m so pleased to hear how nutritious it is. Wishing I had birch trees in the garden as I’ve heard that their sap makes a great syrup too. Gorgeous salad, I love samphire and this looks like such a delicious way to use it. Thanks for your kind comments Andrea. I’ve heard of birch sap being used to make wine but don’t know if it is suitable for other culinary purposes. I’ve always suspected it would require a lot of expertise to extract it. From where can I get Samphire? I had it once when dining somewhere but do not know of any source. You should be able to get samphire from a fishmonger. Otherwise, some Waitrose stores stock it when it is in season.